Sooner or later, you will have to speak in front of a significantly large audience. Will it be your 15 minutes of fame… or will it be your 15 minutes of shame? Worry not, as there are a number of public speaking exercises that will prepare you for that big opportunity. Are you afraid that you might forget your lines? Concerned that you might stutter? Worried that you might say something inappropriate? Believe it or not, most public speakers – even the veterans – have the same fears. Yet, they manage to deliver their pieces successfully, with the audience completely unaware of their anxiety! On this page you'll find some public speaking exercises you can do in the comfort of your own home. Practice these regularly and there is no reason why people won’t love what you’ll say and how you’ll say it! Most public speaking fears stem from the fact that while on stage, we won’t be able to see ourselves. Hence, we tend to assume the worst. "My hair might be messy," or "there might something coming out of my nose," or "my tie might be improperly knotted" are just some of the things public speakers think of when delivering their presentations. Practicing in front of a mirror will condition your mind to visualize how you deliver your speech when the big moment comes. This way, your fears will diminish. Seeing yourself speak in front of the mirror can only do so much. Extend your public speaking exercises even further by speaking in front of a "friendlier" audience: your family. Ask them for suggestions later on so that you may improve your delivery. Here's a little known fact: public speaking is more of an art than a science. It's more of a show than a lecture. More attention is given to how you deliver your piece than to its content. Sad? Perhaps. True? Absolutely! Hence, it is easier to "trick the system," so to speak. Practice assigning a certain tone to important points of your speech. Shout out the lines that are meant to shock the audience, if you have to. Whisper the lines that denote exasperation. 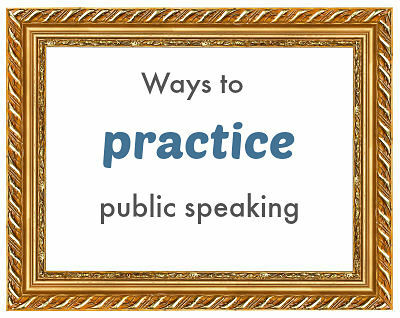 There are a lot of public speaking exercises, but this can provide the most immediate results. REMEMBER: you don't have to memorize your lines. If you memorize each and every word you'll say, you'll just sound robotic when you deliver your speech. Worse, this might cause you to fumble in finding your words because your tendency is to forget them. Instead, memorize the gist of what you want to say, then practice expressing it spontaneously. 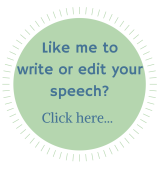 Armed with the gist of what you want to share, you'll never lose track when you do get to deliver your speech. IMPORTANT: create an outline, and rely on it! Most speeches fail because they sound directionless. They're like random lines joined together to create the semblance of length to fill up the time allotted. In the previous exercise, you were asked to memorize the gist of what you want to share. That gist should be incorporated in an outline that should work towards delivering your ultimate point. the fourth should tell the audience why the suggested solution is the best choice. Of all the public speaking exercises, this is the most critical. Practice these public speaking exercises whenever you can and you'll be an accomplished speech-maker in no time.